Growth takes a lot. 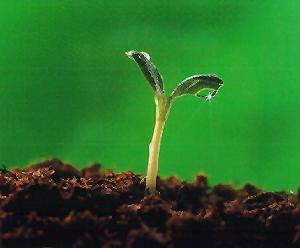 Let's take a moment and think that somewhere a seed sinks deep enough into the soil to take root. Of course, that wouldn't happen without enough water, sunlight, nitrogen, carbon dioxide... well, I think you get the point. Next month will be a sort of anniversary for my wife. She took a bad situation and planted a seed. That seed was an education in the field of medical coding. She fed that seed a lot of her time, energy and passion. That nurturing allowed it to sprout recently in the form of a certification by completing her coursework with flying colors. That sprout has matured over the last few months and today... it bears fruit. Kerry isn't the type to pat herself on the back, shout out her accomplishments to the world or bring them up unless pressed. That's her husband's job. Speaking of jobs, that's what she starts today. Of course, you really never know what you are going to accomplish until you put your feet in the right direction and start pushing forward. You will never know how proud I am of her. (That Bee Gees' song "More Than A Woman" is hard to get out of my head right now.) She's a true fighter and is more than deserving of my awe. Anyhow, a few hours from now, I'm going to make her a nice breakfast as she prepares for her first day at work. As anyone would be, she is a little nervous. Here's hoping that with a few nutrients and the sunshine on her (as it always is) she will have an amazing day and continue to blossom.